The following is an edit of a post which first appeared in February 2010 on The Blah Blah Blog. On the Tuesday morning [26th January 2010] we had arranged to take Lawrence to see one of his windows at Pett in Sussex. Sean the SatNav managed to get us to a church in an adjoining village and via a very picturesque route through winding and very steep country lanes. This was a little embarrassing as I had been trying to explain how the SatNav worked after Lawrence had asked me about it. We weren’t far away from Pett though and with Stephen consulting the map we were soon at the Church of St Mary & St Peter. Two local historians were there to meet with us and they were most keen to speak with Lawrence and ask him about his window. He became animated in this conversation and was obviously in his element. His signature was difficult to see on this window as it crossed over two different colours of glass, but I was able to show him a closeup on the back of my camera – which then involved a further explanation of how a digital camera worked. 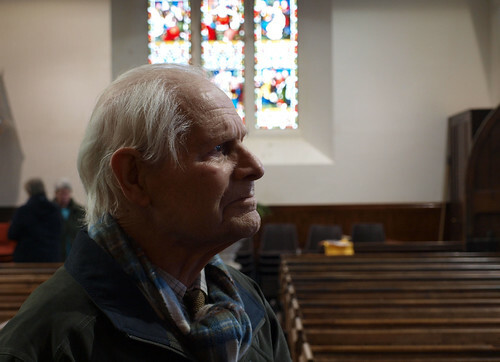 I noted an intense curiosity in the old gentleman – I hope I’m as interested in ‘things’ when I get older, and I hope that people will take the time to talk to me about ‘things’ and not be dismissive as I know some can be. It was a very cold day and we were soon ready to leave – again after having given email contact details. We drove down to the local pub but unfortunately it was not going to be open for a while so we decided to take Lawrence home. A quick coffee with Caroline and Jessica warmed us up before we set off to capture some more windows. Our first port of call after leaving Brede was Heathfield. We had initially planned to visit there on the Monday but time had run out so we decided to slot it in to this day’s journey. The people who met with us to let us in to the church referred to this window as the ‘Pocahontas’ window. It depicted the Rev Robert Hunt performing the first Holy Communion in Jamestown, Virginia. Around him were Native Americans. We were told that American visitors were particularly interested in this window and that the recent Disneyfication of the Pocahontas story had a lot to do with it. I couldn’t quite see the connection with the two stories but could see that any link could be stretched sufficiently in order to please tourists. I wasn’t keen on the window for a number of reasons. The light in the church was lovely though, so I did manage a few ‘arty’ shots of a hymn book on a pew. I loved the colours in this window. Blue and orange is always a winning combination. Stephen and I were both hungry by now and found a pub in the newer part of Heathfield – the Prince of Wales – and stopped for some cheesy chips. We then moved on to Sundridge and a very striking window depicting Christ with an orange robe set against a blue background. I’m not religious so I am drawn to these windows for purely visual reasons. This time it was colour. Surrounding the central figure were depictions of ‘good deeds’ the former church warden who gave us the keys (she still holds them) said that sermons are still preached using the window as a guide. I gathered that this was common practice and was an original purpose of stained-glass windows beyond that of ornamentation. I have a lot to learn still about churches and windows. 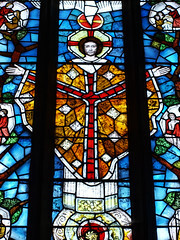 Detail from the window at Brasted – LSL’s last big window. Click through for full window. We battled out of Sundridge through the thronging 4x4s of parents collecting their offspring from the nearby school (on a steep and narrow hill) and took off for our final church of that day at Brasted. The window and another by John Hayward had been installed following a fire in the church in 1989. LSL’s had been completed in 1992 and was his last large window. It seemed as though he had crammed everything into it and it was quite something to see. The photographs do not do it justice unfortunately. Once again the light was beating us and we set off to Redhill where we were to stay the night with Pippa Martin – one of LSL’s former assistants, who we had met on our previous visit to Surrey back in September. Another lovely relaxed evening and another early night. I might just be getting old, but don’t tell anyone. Most of the images link to larger versions of themselves, but some will take you to other views of the same window or to sources of more information. Always worth clicking through. 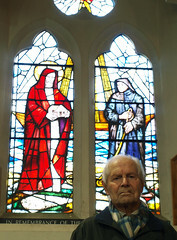 Centenarian Lawrence Lee, studying one of his stained glass windows at Pett, Sussex in January 2010. Photographer, graphic designer, maker, researcher. This entry was posted in On the Window Trail and tagged art, Brasted, Brede, church, church window, churches, glass, Heathfield, Kent, Lawrence Lee, Lawrence Lee Project, Lawrence Stanley Lee, Pett, Philippa Martin, Pippa Martin, Redhill, stained glass, stained glass art, stained glass window, stained glass windows, Sundridge, Sussex. Bookmark the permalink.